THE PLATE SAYS IT ALL !!! 1974 J10, 4IN LIFT, 33IN PRO COMP MUD TERRAIN TIRES. RUNS GREAT. HEAD TURNER! Larry's Comment: I have to agree Ricky. Hummers have always been "wannabe's". 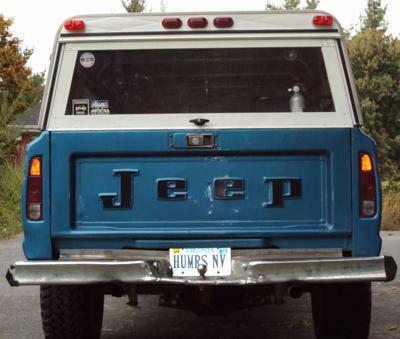 Great license plate...and great old Jeep truck!